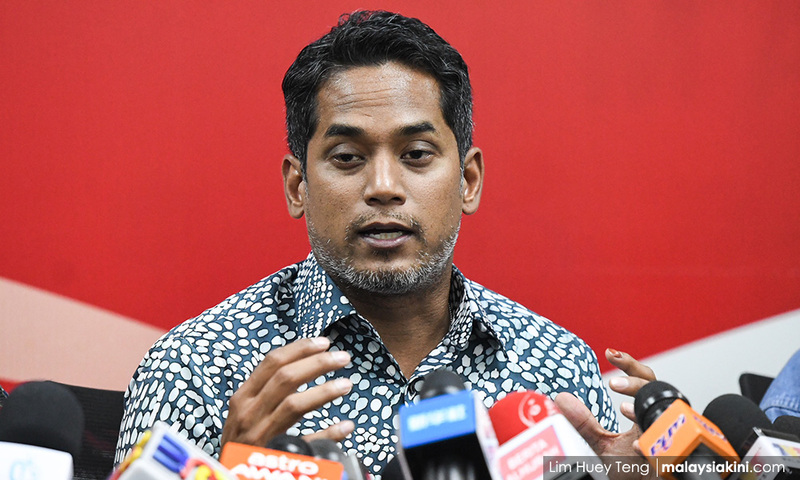 YOURSAY | Khairy is assuming people want to join Umno; they don’t. Buat Apa? : Nice try, Khairy Jamaluddin. The Umno Youth chief doesn’t have a moral leg to stand on. His moral authority was reduced to zero the whole time he stood shoulder to shoulder with ousted prime minister Najib Abdul Razak, knowing his hand might well have been in Malaysia's cookie jar. But he said nothing. Nor did he against Wanita Umno chief Shahrizat Abdul Jalil. Nor on the Scorpene affair, or the murder of Altantuya Shaariibuu. Like the shirker he is, he clammed up. Here's a suggestion for him: get a kite, paint the Umno logo on it, and go fly it. What makes him think he’s better than Najib or anyone else in the fallen goon-squad with whom he served? Anonymous Hotplate: Khairy’s logic is senseless. He assumes that people would want to join a multiracial Umno. They don’t. Korkor: Too little, too late. Umno is facing oblivion, just like Gerakan, MCA and MIC. All these parties refused to accept the reality beginning from 2008, and by 2018, the painful truth came out, and only now you say you will look into a revamp. You want to open Umno to who? Who would want to join the party now? More are opting out of the coalition, never mind the party. MCA leaders dare not contest in Chinese-majority areas and send in young, unknown greenhorns with no political experiences to be slaughtered. They just took part in the election for the sake of saving face. Whatever it is, the die has been cast. Pakatan Harapan is now in power. BN will take years, if not decades, to be a viable force again. CHKS: Umno should have done this in Onn Jaafar’s time. Now, there are decades of keris-waving and outright racism that won’t be forgotten for at least a generation. It will take more than a PR (public relations) exercise for Umno to get back on its perch. Anonymous_3e06: At last, Khairy is speaking the language Umno should have decades ago. Hope he is getting through to them. And yet, here he is mixing up a pitcher of his own Kool-Aid. Anonymous_1371978116: When the proverbial crap hits the fan, pile it all on Najib? Let’s get real here. All of you in BN had a hand in this. All of you were responsible. So rather than blame a fallen leader, why don't you do the right thing and start assisting with providing the evidence for the wrongdoings that was hidden in the past. You want to play check and balance with the new government? Help them clean out the rot left behind by the administration you were a major part of. One step at a time, buddy. FlabberPro: Didn't you say in your pre-election video, starring you and Najib, that many of the things which spilled out from the then-opposition were nothing but "fitnah" (slander)? So, now that you have swayed from your own principles, you are only showing us your duplicity. Are you now going to go where the wind blows with no firm stand on your own? You are demonstrating now that you are in politics just for your own gain. Your biggest mistake was attempting to mislead the rakyat to support a kleptocrat government. You have to live with this regret for the rest of your life. Peace: You regret not saying anything to Najib about the grassroots turning on him? What about your regret for not saying anything about the corruption and abuses of power to the rakyat when they turned on Umno? Anonymous_cdb4fb5d: Yes, Khairy, you like many others in Umno/BN, kept quiet when money was allegedly being stolen. Why? Because you were being fed as well? On the eve of Najib’s downfall, he made one final ‘cash is king’ offer to buy the support and loyalty of the Malaysian people. And in spectacular fashion, it didn’t work. Because the rakyat has principles. A New Dawn: Trying to be apologetic now for his lack of principles? For God’s sake, you were complicit in whatever Najib is alleged to have done. And for God’s sake, have some strength of character. You are saying these things now to position yourself to lead Umno. How shameless. Meerkat: While it can generally be agreed that Najib was the biggest problem for Umno, he is far from being the only problem. We have been oppressed and intimidated by Umno, not just by the Anti-Fake News Act 2018, but a host of other laws thrown at us, which forced some into jail, some into exile. Most of the rakyat showed greater resilience than Khairy, despite facing personal danger and not being in Khairy’s cushy position. Odysseus: Khairy, I don’t think you ever regretted your decision. It was a self-centred decision to save your own skin and political life. You craved for power, and you thought your path to prime minister is via Umno/BN. You never thought for a moment that the people would throw out BN and install Harapan as the new government. Concerned Malaysian: This is normal, it is only when they fail that they realise that the power lies in the hands of the rakyat. Before that, power seemed to be easy and absolute, and they thought it would belong to them forever. Tell us, what lessons have you learned so far? We will definitely listen to you again, as a member of the opposition. We will depend on you as a check and balance to the Harapan ruling coalition. Show us you can do the job well, and you can keep your job.